Utterly compelling! Hard to tear myself away. Hey! Are we really talking about…the telephone? Watch this 30 second clip of Christian Marclay’s art video and you ‘ll be hooked (pun intended)! Christian Marclay, 58, an acclaimed and highly trained artist, loves to combine popular culture with the deepest of human emotions. 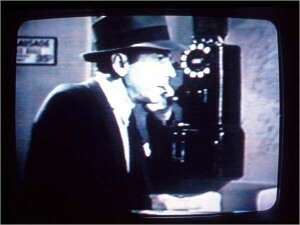 The telephone in his video becomes the starring actor. The ring of the telephone creates the mood, foreboding and suspenseful. The hellos and goodbyes tell the story…the story we imagine. Christian Marclay’s work is also featured in my blog “Time is Art – “The Clock”…a masterpiece.” Click here. Fascinating…if only Marclay could have added answering the telephone from the “Matrix”! I was totally mesmerized by this 7 minute video. My thought was about how powerfully well done these telephone “vignettes” were here, and how we just float over them in the actual movies. Thanks for this “stop and look” with “Telephones”. I too miss the old rotary phones. Didn’t realize why until I saw this. The anticipation while dialing. The clunk of the reciever when you hang up. The ring of the phone. I don’t know. Phones today have no personality. I’m glad my son saved my parents’ rotary phone. This video show a far more civilized culture of people sitting down and focusing on a conversation, versus the robotic idiots walking down a street texting on a phone or talking on a phone while they are working on the computer too.